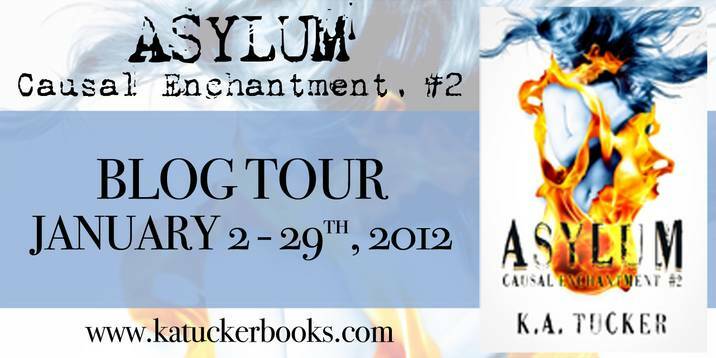 It’s day 2 of the Asylum blog tour and we’re stoked to have a small POV from the hottest vampire out there Caden! Just a few quick things before we get to the excerpt. Today at 7pm EST or 4 pm PST we are hosting a twitter party for the release of Asylum so make sure to follow Patricia, Jaime, and Kathleen on twitter and tune in she’s giving away eBooks of Asylum and bookmarks make sure to follow the hashtag #AsylumParty. The best part is if you haven’t read Anathema yet never fear it’s free right now there will be links to get it after the excerpt. Also make sure to follow along the tour stops there’s eBook and signed book giveaways! I opened my eyes to see blurry black lines against a sky blue background looming over me. I don’t remember this…Had I been…asleep? That was impossible! After being conscious for seven hundred and forty-odd years, the very idea of time passing without me bearing witness was unthinkable. Yet, here I was now… Where was I? I blinked several times. The blurry black lines sharpened into a spider web-like pattern against a glass dome - unspoiled, undamaged by time. This is new. Rolling my head to one side, I found beautiful, pristine brick walls and manicured gardens surrounding me; to the opposite side, silky blonde curls. Amelie, my sister. Wild emerald-green eyes told me she was disoriented as well. Slowly, I pulled my tall, lean body up - first to a sitting position and then to my feet. Every muscle screamed in protest, still not fully awake from whatever ordeal I had endured. That was when I saw them. Bodies, sprawled throughout the atrium. So many of them. So many of my kind; all of them either unconscious or barely coherent. Exhilaration tore through me like a violent storm. With awe, I absorbed every detail long-since lost to us with renewed focus - the working light fixtures, the perfectly-shaped cobblestone paths, the polished silver car. These were not the signs of a world long-since void of humans, destroyed by war. These were the signs of a thriving world. A new world. A human world. A single tall, sleek figure stood some distance away from me, her long corn silk blonde hair cascading over her shoulders, her startling chocolate brown eyes locked on my face. She stood with fists balled up against her lean thighs, her chest holding a lungs-worth of air. Fear and uncertainty stared back at me, her brow crooked questioningly. I couldn’t sense her blood! That sweet nectar coursing through millions of veins - that which made her human - was surely there but I couldn’t smell it! Nothing had changed from our time on Ratheus. But perhaps everything had changed! Were we immune to that unmanageable blood lust after being without human blood for so long? Yes. I felt the corners of my mouth crook into a smile. That would make this transition so much easier! Evangeline saw me smile. Serenity washed over her face. She smiled back. I breathed a sigh of relief. That was when my nostrils caught it - the first hints of intoxicating sweetness, tickling my senses. There was only one like it and it was impossible to ignore, impossible to forget, even after seven hundred years of being without. In another second, the full impact hit me, a microburst of desire, my entire body rippling with exhilaration, my vision tunnelling to one thing. One thing only. Nothing else mattered. My eyes began to burn. That meant the hideous veins were revealing themselves, pulsating. She was so close…I took a rigid step forward. No! I mustn’t give in. I’ll lose control. I’ll lose myself. I took a deep breath, gritting my teeth, trying to restrain myself. But another tidal wave of desire hit me, even more powerful than the first, almost buckling my knees. A giant black muzzle blocked my view just as I heard Evangeline scream ,”No!” and then it disappeared along with her and that delicious sweet liquid flowing through her frail veins. I know what you’re thinking “OH NO!” right? Well to find out what happens you’ll need to read the books and let us tell you they are awesome! Jaime read Asylum and it is incredible! So to enter the contest fill out this FORM and go to Amazon, Barnes & Noble, or Smashwords to get your free copy of Anathema! And if you don’t want to wait buy Asylum now! Amazon, Barnes & Noble, or Smashwords! Check out the rest of the tour stops here. I can't wait to read Asylum! !